I didn't even keep it for 10 minutes, a total waste - not even worth 1 cent! Very bad ringers...Not worth it. They do not sound good at all. All ringers on this program are dated. Cannot believe that iTunes is not verifying for quality apps. I really enjoyed this... so many sounds!!! The whole family had fun with this one. 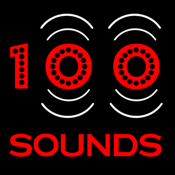 Fun App Easy to use and tons of sounds for the Iphone at your fingertips. A must have for anyone who wants different ringtones! No gasten ni tiempo ni dinero !!! It's a scam. Don't waist your .99 cents. It's stupid. And the sounds are not even fun. Waste of money! Very few that could be used for anything. Many of them can't even be heard. Fun app, works as advertised. Works great... just make sure your iPhone's MUTE switch isn't on! It's way too complicated to get a ring tone on the phone. It's terrible. This did not give me the music that I'd hoped for. Stupid does not work. Waste of time and money. Not all worth the money for the price. (€) ^ (€) _______ it isn't worth the money for the price, goods and bads Good: lots of sounds and shockingly good selection. Bad: they don't sound real, I think they need to be more realistic. 5 stars without a doubt. This app rocks! My kids and I all love it. Very highly recommend this app!!! Super fun and very high quality sounds. I have told all my friends to get it... They have... And they all love it too. 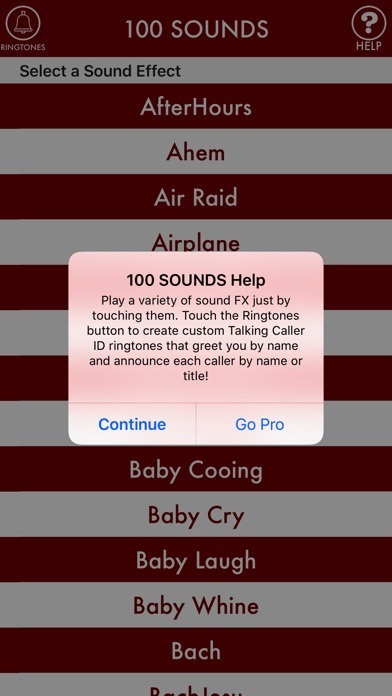 I also decided to get this company's app called Auto Ring Tones and that one rocks too! Great apps. 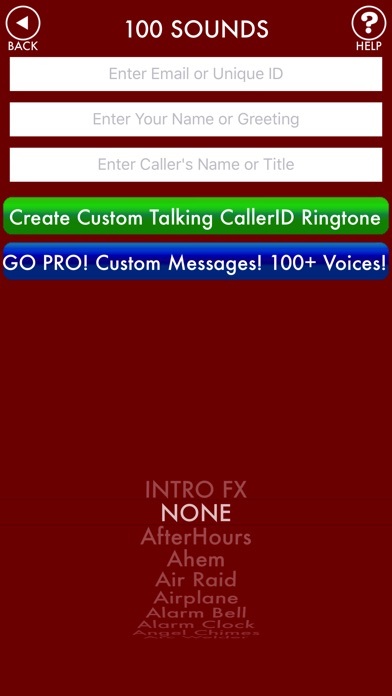 I was a little skeptical at first...The app sounded complicated and not really worth the 99cents but trust me if you are looking for ringtones this is it. I got over 200 ringtones in about 5 minutes compared with the one ringtone I bought for 99cents from the itunes store. If ringtones are what you are looking for then GET IT! Quality Tones - Works Great !!! This is a joke. 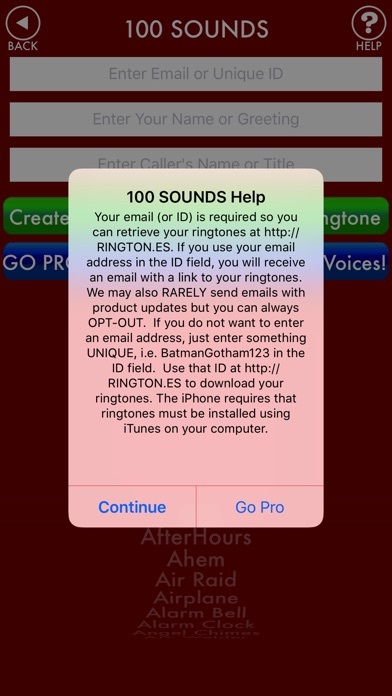 This is a scam to have people buy into links that sell legit ring tones. This is not a ring tone. Buyer beware! Glad I picked it up. New entry into the iPhone ringtone for me. Thanks! I used this ap as part of a lesson for a science project. I needed some sounds of things that were solids (e.g. a drum, knocking sound) and sounds of things that were liquids (e.g. ocean, rain). It was a quick and useful resource. This would be an okay app if you could download from the phone. I don't like that I have to drag and drop on my computer. Very very very funny in band class to hear random elephants and roosters. Get it. Rofl PERFECT for waking up your friend, sibling, parents, etc! My friend is really angry at me for calling him and looping the Sea Lion noise and putting it up against the phone speaker! Nice job guys! BUY THIS!!!!!!!!!!!!!!!!!!!!!!!!!!!!!!!!!!!!!!!!!!! You will NOT find a better deal,OR, better communication and support from this vendor. Definately worth more than he is asking !!!!! I'm looking for a really deep, drawn-out, shipboard foghorn. The one I just downloaded sounds more like a diesel truck on the highway. I grew up in San Francisco and remember hearing the horn on the Golden Gate Bridge as a child. It was a real window-rattler!! Could we find something similar?? 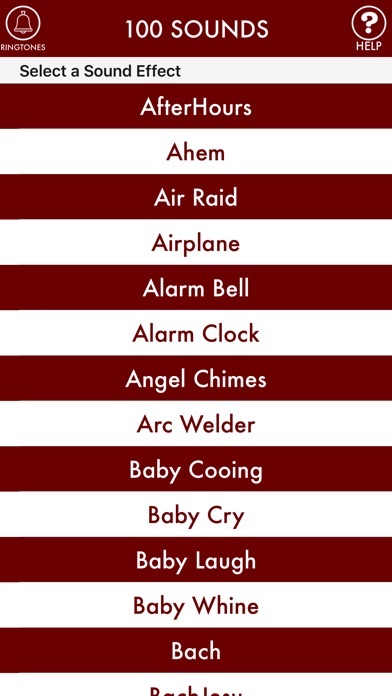 These ringtones are awful. Don't waste your money. What a rip off. Cant download the ringtones even when you follow the prompts. Good thing it is only a buck but still feel totally violated. I thoughts itunes screens these kinds of sites. I trust when it is in the app store that it is a credible site. Its worth the minor hassle to get them into ITunes...I did it with no problem and I am not good at this stuff!!! AWSOME Ringtones and immediate help!!! These people were AWSOME at helping me with my problem of loading my ringtone on my iPhone from my Mac. Their response was IMMEDIATE! I needed a louder and more noticeable ringtone because I was missing some calls. Not anymore, with Sirens. Thanx, so much Todd Bernhard!!! I have had this app. for a while and used it once but since has to re-set my iPhone so now I have delved into this app. and set up a bunch of ringtones from it. It is so easy and fun! What a great app. and saves so much time and money with just a few clicks of the mouse! With me being a firefighter, I kept looking 4 a profession related ringtone. Then my homie told me about this joint. Other people r saying it's a hassle 2 dwnload....bump them! U'r life isn't that busy! Nice app, keep it up y'all! !